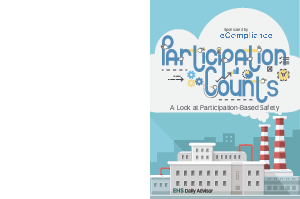 Check out our recent survey summary in a report entitled Participation Counts! A Look at Participation-Based Safety. The survey and its accompanying report, both sponsored by eCompliance®, provide insight into how safety professionals and their companies are encouraging employees to actively participate in safety initiatives in order to promote consistently safe behaviors on the job. The study was conducted in May of 2017 and illustrates the diverse opinions within the safety field regarding such issues as implementing behavior-based vs. participation-based programs, measuring safety participation, and management visibility into safety performance. 15% of survey participants believe that behavior-based programs have a negative impact on safety culture, and 55% think participation-based safety is most effective. While 72% those polled believe management visibility into safety performance is “extremely important,” only 30% of survey participants said that management has “complete visibility” into safety performance at their companies. 98% of respondents believe that increasing the level of worker participation in safety will improve safety performance. 14% of survey participants don’t measure safety participation at all, and an additional 10% said that they don’t currently measure participation but plan to begin doing so within the next 12 months. To read about more findings of the study, complete the form to download now!